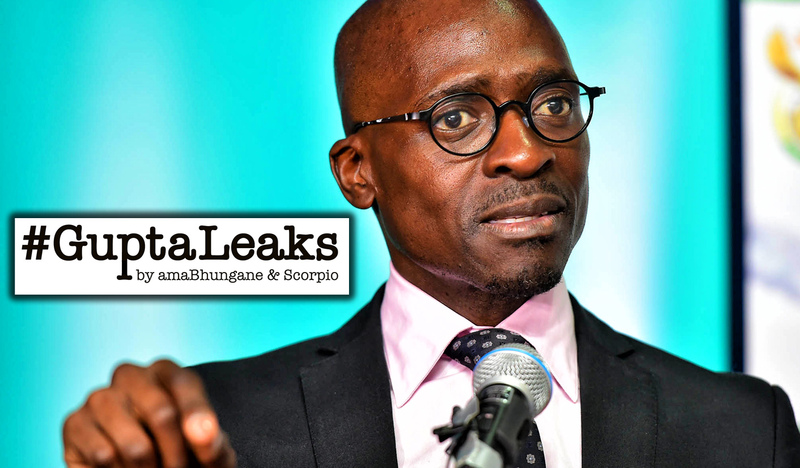 amaBhungane and Scorpio #GuptaLeaks: Did Gigaba and officials grease Gupta gears? President Jacob Zuma’s sacking of Finance Minister Pravin Gordhan has been explained by many in light of the notion that the national Treasury stood in the way of Zuma’s pet projects. Some of these featured Zuma’s friends, the Guptas, who appear to have waged their own campaign against Treasury. Gordhan’s replacement was Gigaba, who inevitably stands under a cloud of suspicion. Thanks to a leaked trove of data from the heart of the Gupta empire, the cloud is growing heavier. By AMABHUNGANE and SCORPIO. The #GuptaLeaks reveal new evidence that immigration officials may have been captured by the Guptas – including two who were specially positioned in India by Malusi Gigaba’s office when he was home affairs minister. E-mails show how senior Gupta employee Ashu Chawla repeatedly asked these two and other officials to fast-track visas to benefit Gupta businesses as they moved dozens of employees, associates and family members between South Africa, India and Dubai. Previous evidence of Gigaba and his advisers’ relations with the Guptas have raised suspicions. These were underscored when President Jacob Zuma – who is close to the Guptas – controversially appointed Gigaba as finance minister in March. In a string of e-mails, a home affairs official says Gigaba had signed an “instruction” for the two officials to be moved to offices in Mumbai and New Delhi respectively. However, Gigaba’s actual signed letter was not attached to the #GuptaLeaks e-mail. At least one of the two officials already had a long-standing relationship with the Guptas and their lieutenant, Chawla, through private business projects and having apparently helped with visas in the past. Chief among Chawla’s contacts in home affairs was one Major Kobese, a music producer and director in home affairs’ foreign office. Chawla appeared to have Kobese at his beck and call, often asking him to iron out visa troubles. In a number of e-mails, Kobese berated officials for not arranging visas for Chawla, or for not arranging them fast enough – then he forwarded these internal communications to Chawla, suggesting their relationship was closer than arm’s length. For example, Kobese wrote to an embassy official and complained that she demanded “additional requirements” of a group of nine business people and delayed their trip. Then he brought in Gigaba: “I have copied the minister’s office on this e-mail, for purposes of feedback.” Two minutes later, Kobese forwarded his comments to the Guptas’ man, Chawla. Sahara Computers is a Gupta-owned firm where Chawla works. Kobese copied Chawla on this e-mail. Chawla dutifully sent the message and the song to managers at ANN7. Kobese appeared to be central to Gigaba’s two Indian office appointments late in 2015. The officials were Gideon Christians and a “Ms Munyadziwa”. According to a CV in the file, Christians had worked in immigration for 20 years. In 2008, he moved to SA’s high commission in New Delhi. He stayed in India until 2014 when he moved to Cape Town International Airport as an assistant director in immigration. Over those years, Christians built a relationship with Chawla and the Guptas. For example, in 2011, Christians e-mailed a South African third party’s offer to sell “A Grade Coal” to Chawla and another Gupta executive. A month later, Christians sent Chawla a coal sale and purchase agreement with prospective Chinese buyers, “as per my meeting with Mr. Gupta yesterday”. Chawla and Christians’ relationship grew, with Chawla helping Christians to let his Cape Town property and later to import a motorbike from India. Meanwhile, Chawla sent Christians many requests for expedited visa approvals. When the Guptas prepared to launch ANN7 in 2013, the flow of e-mails was particularly strong as the new TV station sought to employ Indian nationals in South Africa. On another occasion, a Gupta associate wrote to Chawla and Tony Gupta. The associate explained that his colleague had been banned from visiting South Africa after officials found he had sent “fraudulent” immigration documents. Chawla was asked to “please help in taking this ban removed, I did speak to Tonyji [apparently Tony Gupta] and he thus instructed me to take this up with you [sic]”. Chawla promptly forwarded the message to Christians. It is not clear what became of the matter. The answer was not clear, but Christians sent an updated CV a year later and in October 2015, one of Gigaba’s ministry staffers sent an “approved submission for Strategic Re-deployment of Officials in Missions”. The document is not available, but subsequent e-mails indicate that Gigaba had approved the transfer of Christians and “Ms Munyadziwa” to missions in New Delhi and Mumbai, respectively. But officials pushed back. One suggested they were in the dark about the appointments and others explained that there were no vacancies and no budget for the Christians and Munyadziwa appointments. Chawla’s contact Kobese tried to persuade them otherwise, but he slipped in that “this deployment was done outside the normal recruitment process”. Separately, both Kobese and Christians forwarded the correspondence to Chawla, outside of the department. It is not clear if Christians was seeking Chawla’s intervention, however an online report suggests Christians was based at the SA High Commission in New Delhi a year later. We were not able to positively identify “Ms Munyadziwa”, however the #GuptaLeaks reveal that one Khathu Munyadziwa was in Mumbai by December 2015, when Chawla e-mailed her. Reporting on the #GuptaLeaks this week, Times Media Group published that when Gigaba was home affairs minister, his adviser Thamsanqa Msomi pressured officials to help Gupta associates get visas. Further #GuptaLeaks files reveal that, in February 2016, Chawla arranged to fly Msomi to Dubai and put him up at the luxurious Oberoi Hotel for a few days. The Guptas have hosted numerous senior South African officials and politicians at the Oberoi, the #GuptaLeaks reveal. Chawla also leaned on Gigaba – in a letter addressed to the minister but sent to adviser Msomi, now also a Denel director – to try to get South African citizenship for three members of the Gupta family, including Ajay Gupta’s son. Scorpio is the Daily Maverick’s new investigative unit. If you’d like to support our work, click here.